Truly a one-of-a-kind bag. Each bag is hand embroidered and hand made in Mexico. Styled in the tradition of the embroidered Mexican dresses and blouses that have been popular in Mexico for generations. 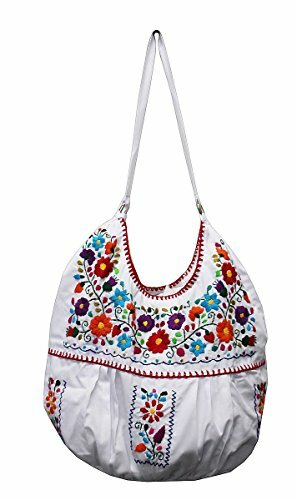 Each bag has a colorful floral embroidery pattern. The bag measures 14" in width by 12 in length, with a 14" strap drop. The interior of each bag is made of a durable cotton muslin material and includes one pocket along with a silver snap enclosure to keep the bag securely closed when needed. You are sure to be noticed with this beautiful hand made item. Measures 14" wide by 12" long, with 14" strap drop. If you have any questions about this product by Del Mex, contact us by completing and submitting the form below. If you are looking for a specif part number, please include it with your message.